Rams RB Todd Gurley says he has been loving new coach Sean McVay’s offense. Gurley took a step back in his second season, as his overall grade dropped from 75.4, to 68.8, which ranked 33rd out of 62 qualified running backs. 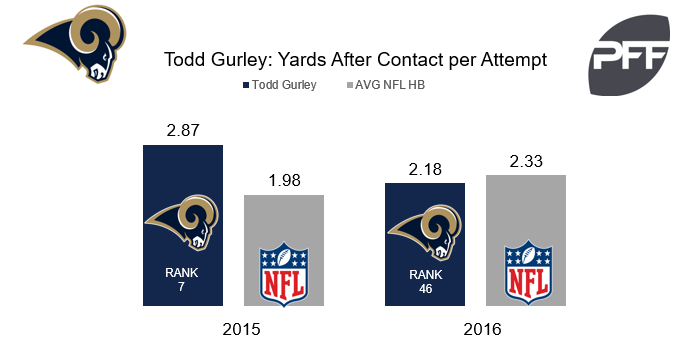 Gurley was seventh out of 52 running backs in yards after contact per attempt in 2015 at 2.87, but he saw that number drop to 2.18 in 2016, putting him 46th out of 53 qualified backs.